There is not much to improve in group stage of 2013/14 Men’s European Champions League, but upcoming Friday and Saturday could offer some new answers on question: who is going to quarter final? The biggest battle is coming from Group B, at Verkhnaya Pyshma, where Russian champion UMMC expects the 2012 German Cup winner Saarbrucken. There are no secrets between these two clubs, the rivals from 2012 MECL semi final (UMMC progressed to the final after very exciting rematch at home). In Round 2 of 2013/14 season, at Germany, Russian side won 3:0 (9:3 in sets) so Saarbrucken must win this Friday to keep the chances for the next stage. In this group UMMC and Pontoise have 3-1 score, Saarbrucken 2-2 and Eslov 0-4. UMMC has complicated its situation losing at home from Pontoise last week, but still holds control in its hands. Coach Tatiana KUTERGINA was disappointed with a play of Japanese Jun MIZUTANI who lost both his games (from Marcos FREITAS and WANG Jian Jun): “Two defeats of Jun MIZUTANI are not acceptable. He didn’t arrived in good shape. I hope that we learned the lesson and to show totally different play against Saarbrucken”. In case that UMMC and Pontoise (this Saturday meets at home Eslov) win this weekend, they will reached quarter final no matter of Round 6 results (December 20th). French club is clear favorite against Swedes who still has no victory. 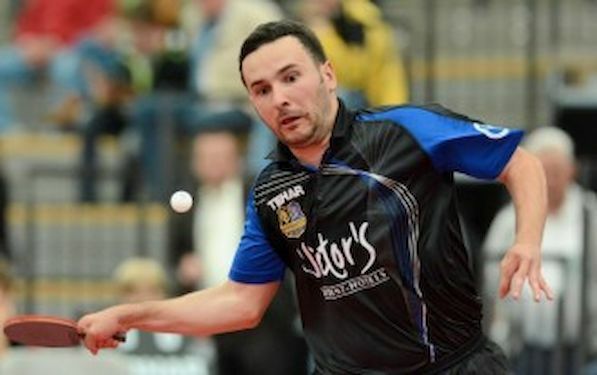 The 2009 MECL finalist, LIEBHERR Ochsenhausen needs almost miracle this Friday at Group A, knowing that just win at Orenburg can open the door of quarter final. Russian side, the reigning champion, already booked its place among the best eight European clubs, while German club suffered two 3:0 defeats. If Orenburg wins again, RYU Seung Min & Company must overcome Angers in ultimate round better than 3:0 (9:2 in sets). However, Ochsenhausen`s president Kristijan PEJINOVIC is emphasizing that his club has nothing to lose in upcoming games. After 3:0 away victory against Walter Wels, Werder Bremen returned all power at its hands at Group C. Actual German champion If they beat Hennebont, French side will resolved the question of its destiny in last round against Austrian club, playing at home. Who could bet before the season that Round 5 match Borussia – Chartres will not have any significance for the placement in Group D?! Ten times European champion lost all three its games, while French champion and actual leader of French national league (all 7 wins) Chartres won twice 3:0 (Borussia at home and Niederosterreich away).